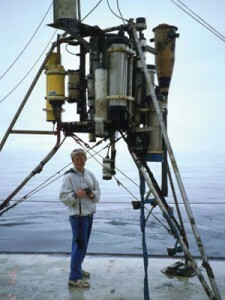 Marlene Noble next to a Geoprobe tripod designed to measure bottom suspension processes and proﬁ le currents over the entire water column. Th is tripod was deployed for four months in 60 m of water oﬀ Huntington Beach, CA. I started my scientific career pursuing a Ph.D. in elementary particle physics at Princeton. While there, I became frustrated with a field that was becoming increasingly congested; individual scientists tended to be responsible for only small portions of large research programs. I decided to change fields. I had taken a few undergraduate courses in oceanography at the University of Washington and was a summer intern in the field. I thought that oceanography was less esoteric than particle physics and that understanding transport patterns in the coastal ocean could be an interesting challenge. I transferred to Woods Hole Oceanographic Institution. I was subsequently hired as a physical oceanographer at the U.S. Geological Survey. While there, I finished my Ph.D. at the University of Rhode Island. At that time, coastal oceanography was a relatively new, compact and exciting discipline. Management policies for the coastal ocean were just being developed. One of my biggest challenges at the USGS was to develop cooperative research programs that would (1) further our understanding of coastal-ocean transport processes and (2) provide solid information to coastal-ocean management agencies. Hence, our programs tended to combine basic and applied research. At the moment, we are working with the Environmental Protection Agency to monitor and model the transport, deposition, and fate of DDT-contaminated sediments off southern California. While carrying out this programs, we also model resuspension processes associated with energetic internal bores and determine the velocity structure of violent turbidity currents in submarine canyons. Many years ago, when I first became an oceanographer, it was somewhat unusual for women to go to sea. However, both WHOI and the USGS were quite supportive. Now, men and women at the USGS share bunkrooms on vessels that have limited accommodation options. Unfortunately, women were and are still under-represented in the field. There are only a few women senior scientists at the USGS. Given that my husband and I are both physical scientists (he’s in laser fusion), we share many common interests. We were fortunate to both live on the east coast in the early days. We bought a small plane to facilitate travel between Princeton, NJ or Rochester, NY (his residences) and Woods Hole (mine)—the best little weekend “commuter” airline in the region. When he moved to the Lawrence Livermore Laboratory in California, I was able to transfer to a sister USGS office in Menlo Park. We finally bought a house together! In general, oceanography is and has been an interesting and rewarding career.